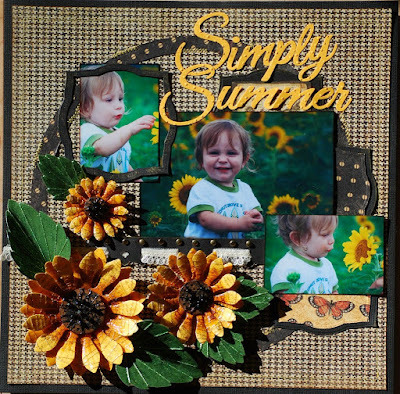 Another winner Dawn.. so glad to see you work..
pssst .. i have an award for you on my blog .... layout is outstanding! So sheerful .. love those flowers! Oh wow Dawn those sunflowers are stunning! Love the thread and beads, you never cease to amaze me with your creative ideas! 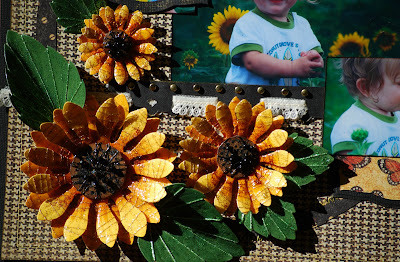 They are just perfect with those gorgeous photos of Dusty with the sunflowers. Dawn, I'm loving this one! The pictures are precious. You always take the best pictures and capture the cutest expressions on your kid's faces. Love the sunflowers!! I think I come to your blog only because the song makes me happy...something about it reminds me of summer...oh, how fitting for this page! hehe! Ok I think I need whatever camera you use! All your photos are amazing! I can not believe you scored these pics, they are insain! what a sweetie to scrap too! Those flowers are some of the most beautiful I have seen..so much neat detail in them! Yes, I love winter and snow...but I have to admit I too am looking forward to warmer weather...thanx for bringing in a little warm breeze with this beautiful creation...I love the photos and the flowers are fab...great work ms dawn...you rock! Dawn, those sunflowers are out of this world, and the centers, wow, gorgeous! Dawn, Your work is truly inspiring! I left you a little something on my blog. Stop by and pick it up! OMGOSH this is soooo awesome Dawn!!! I HAVE to get those dies...The photos are sooo beautiful! Love this one! The flowers are stunning! I too want summer to come - yesterday! So over this winter crap! I love winter but boy the gloomy days are killing me here! WoW...this layout is stunning! The flowers are sooo beautiful. 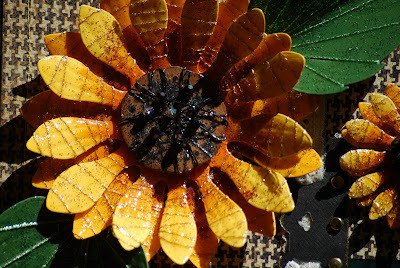 I luv how you put the beads on the centers of the flowers. Hope you don't mind but I added your fab blog to my blog roll. Your layouts are awesome! I love them all! !